This fried meatball (gorengan bakso) is usually eaten with Meatballs sup (bakso) or Chicken Mushroom Noodles (Mie Ayam Jamur). Yet, Indonesian also eats it as an appetizer or snack. It serves better with Chilli Sauce. This meal is actually influenced by Chinese cuisine called Wonton, a type of dumpling commonly found in a number of Chinese cuisines. 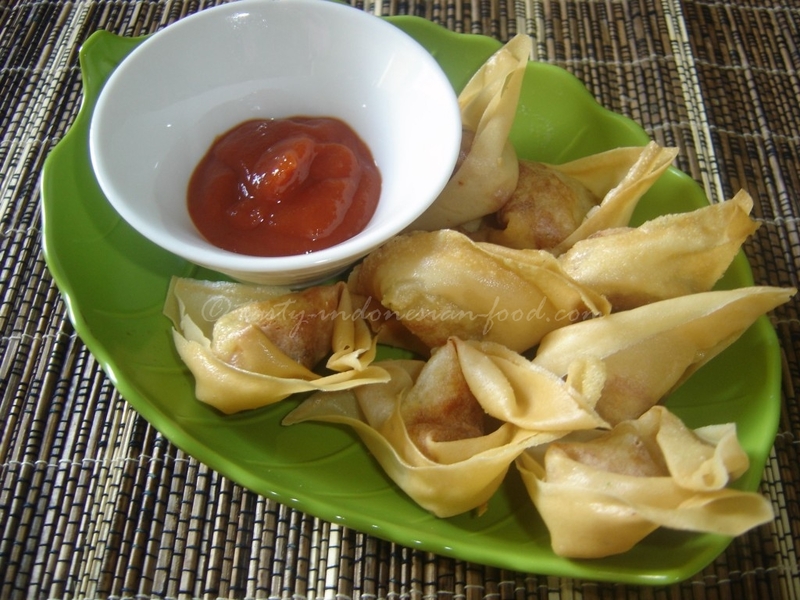 For easier and simple method, you can always use ready use Spring Rolls Sheets. 1. Mix all ingredients for meatball (except spring roll wrapper) and grind them in food processor until it’s sticky. Then put in fridge for 45 minutes to one hour. 2. Take the wrapper then put a ball of filling into the middle then wrap it triangle and pinched the corners. 3. Heat oil in deep fryer, and fry with medium heat until it is golden and cooked. 4. Serve with fresh chillies or chilli sauce.